Are you looking for something to step up your wardrobe game a bit? Check out these accessory picks - the best watches for fashion-minded travelers. The best watches are high quality, durable, and will last you for years to come. Not only are they a great fashion accessory but they’re also super handy for those times when you’re rushing to catch your flight and your phone battery is at 1%. Don’t sweat the small things. Come prepared and get the travel tools you need to do so. The best part is we’ve taken the guesswork out of it. Check out our top picks for the best watches you should be wearing right now. There are so many advantages to having a travel watch on your travels. Just take a look at the best watches we selected and you will see what we mean. From waterproof watches you can take swimming and snorkeling to smartwatches, these travel accessories will make your trip so much easier. With smart watches, you can answer messages, calls, emails, and more on the go. These aren't your average pieces of jewelry. So how do you choose the best watches for travel? Well, it all depends on your needs. Do you want to stay fit while traveling? 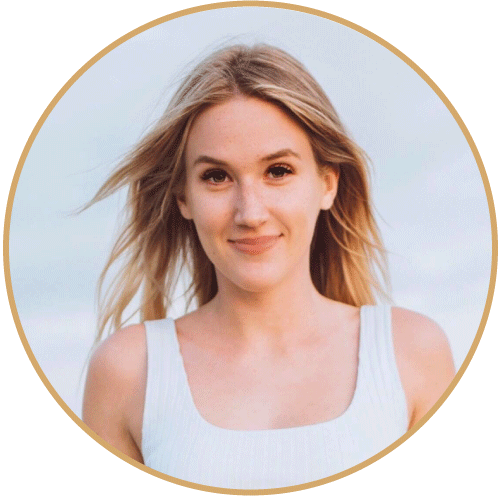 Are you seeking to be more connected to social media, texts or calls, or less connected? Do you want all the bells and whistles of high tech (*insert Spy Kids "my watch doesn't even tell time" quote here) or do you need something that just gets the job done? Whatever you're looking for, you will find it on this list. Alright, here we go. We’ve asked around and scoped out the best watches on the market. These ones are not only stylish but they’re practical too. We have a feeling you’re going to love them just as much as we do. More than fifty years ago, Armitron pioneered many of the first affordable digital watches. Today, Armitron continues to embody and nurture a spirit of individuality by making bold, durable sport watches that are built to move. 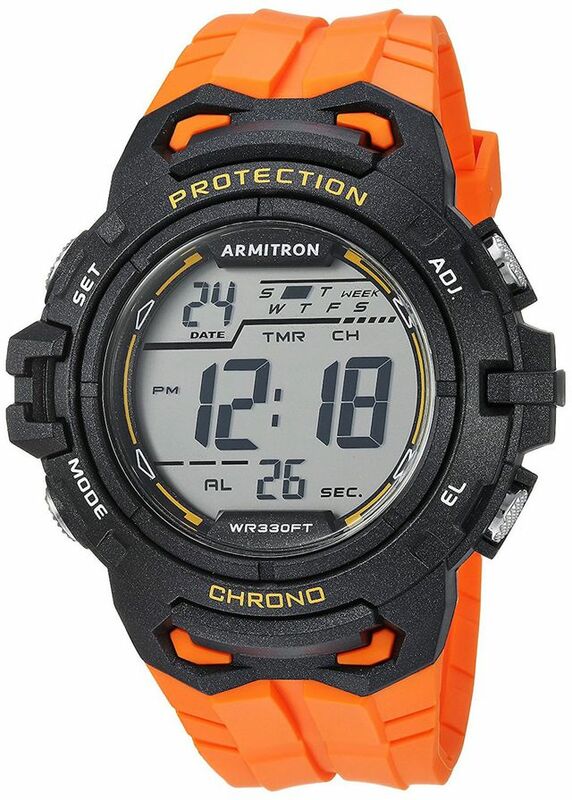 Offering style and performance, Armitron Pro Sport Watches ensure that you are always on top of your game. What do we love most about this watch? Well, it’s hard to just pick one thing. It’s stylish, fun and practical. This black resin case and top ring are made for durability. 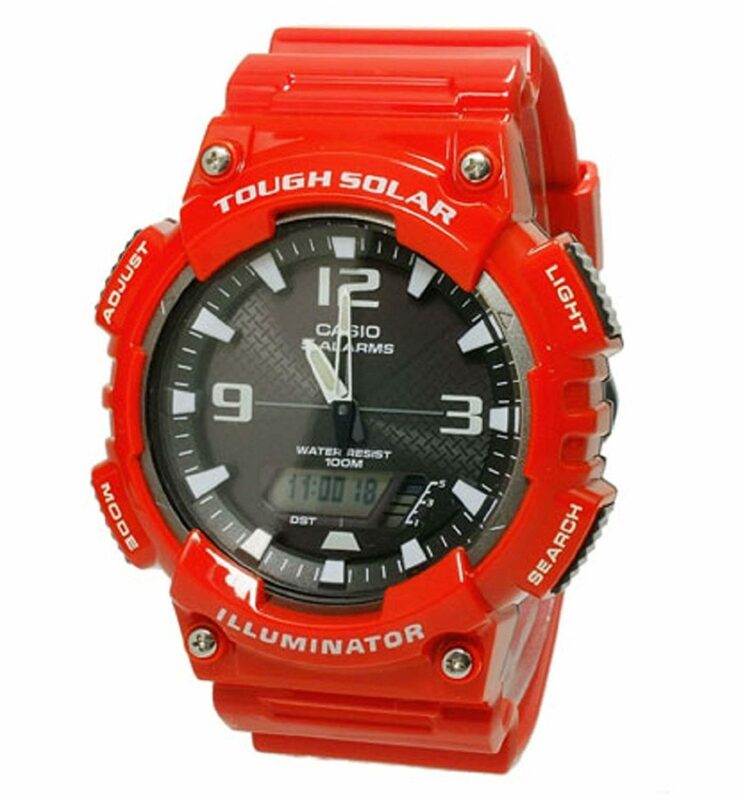 Functions include: chronograph, lap time, alarm, dual time, military time and backlight. Last but not least, it’s water resistant to 100m (330ft): in general. Take it snorkeling and swimming. A square shaped style has never been so cool. This timepiece is inspired by classic design and has an octagonal case shape and button guards that prevent accidental operation. The large case and a 7-year battery make for stylish and reliable timepiece. Casio entered the watch market at a time when the watch industry had just discovered digital technology. As a company with cutting-edge electronic technology developed for pocket calculators, Casio entered this field confident that it could develop timepieces that would lead the market. Never miss a moment with the Samsung Gear S3 Frontier Smartwatch. Thanks to Bluetooth connection, you can receive texts, calls, emails, and more without having to reach for your phone. Featuring a built-in speaker and microphone, you can also make and answer calls hands-free. Pack light for your next adventure. Did you know you can also pay with your watch? With Samsung Pay on the Gear 3, you can easily make a payment wherever and whenever you need to. It’s just as easy as swiping or tapping your debit card. Designed for the elements, this watch is made from military-grade parts. It is able to withstand water, dust, temperatures, and the occasional drop. Venture out with confidence. So get out there and explore. GPS tracks your activity and makes it super simple to share your location. Last but certainly not least, it is able to go nonstop for days on a single charge. When it's time to recharge, the wireless charger lets you power up without slowing down. 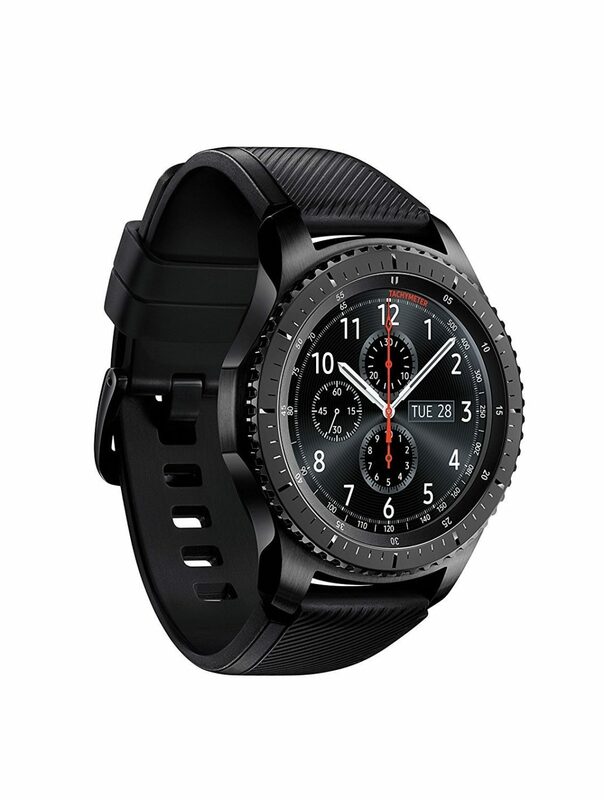 Compatible with Android and iOS smartphones Gear S3 supported smartphones may vary by carrier and device. For a list of compatible smartphones and features, please visit Samsung.com. For best results, connect with compatible Samsung Galaxy smartphones. Enjoy one of the best watches that will stand the test of time. To all the guys out there seeking a minimalist style, Treehut has got you covered. This Rosewood and Ebony Wooden Watch offers an all wood strap quartz analog with push buttons, stainless steel, and a tri-fold clasp. It’s handcrafted using 100% real wood. That means there’s no harmful chemicals or paint used in the process. It’s all eco-friendly and safe to wear. Even the straps are made from authentic wood and the buckles, from premium stainless steel. This watch is engineered for performance. Men on the go consider it an essential. The strap is made from authentic wood as well, and the buckles are made from premium stainless steel. This watch is structured for great performance - perfect for the on-the-go men who consider time to be very essential. Did we mention that it is equipped with high quality Japanese Miyota watch movement? This gives it an accurate and precise time. 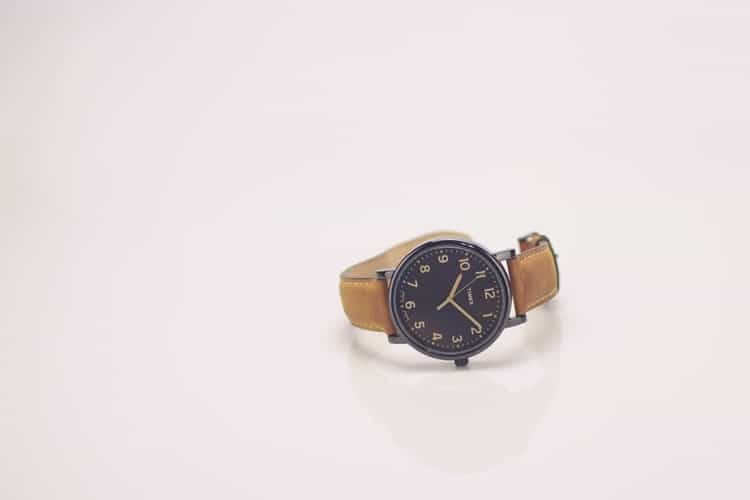 Made from Rosewood and Ebony, this watch’s aesthetic is not just fashionable, but also highly durable. Sporting a simple and classic design, this is suitable to man’s taste. It's not painted, the finish is a polished wood grain. Even better, the battery can last up until 5 years. The bands can fit up to 8.5 inches and can be easily adjusted for when you want that perfect fit. Treat yourself to a great timepiece ideal for any occasion. 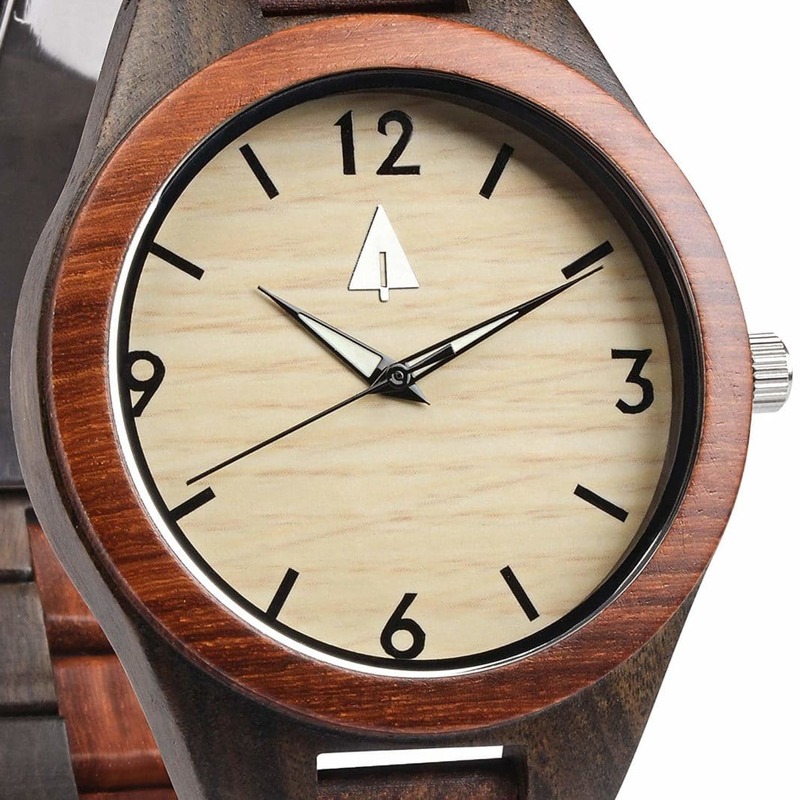 100% Wood: This analog watch is totally Earth-friendly. It is created with real, bamboo wood and has no paint and chemicals included. It is crafted by bare hands of workers, making it extra special to wear. Classic Design: Men will definitely appreciate the simple and clean look of this watch. Thanks to a polished wood grain finish, the entire watch is smooth to the touch and comfortable to wear. With its trendy design, it can be worn with formal or casual outfits. It’s a timepiece great for all occasions! Japanese Quartz Movement: The Miyota time movement of this watch from is precise and dependable. It’s great watch for men who always want to be ahead of their schedules. High Quality: Only the finest materials are used for this watch, making it durable and great for longer use. This watch also has a 2-year manufacturer’s warranty with every purchase. The tri-fold clasp of this watch is made from stainless steel and is also made with push buttons for hassle-free time adjustments. Gift Ready: If you want to get a timepiece with excellent wrapping ready for gift-giving, Treehut has got you covered! It comes with a padded gift box when purchased. It’s the perfect present for your boyfriend or male friend who considers timepieces to be an everyday essential. Discover the power of Google Play. With the Ticwatch, you can download top-rated fitness Wear OS apps like Google Fit, Strava etc. Discover endless possibilities in one place - sleep monitoring, call an Uber, music on watch, multi-language support, news, watch faces and much more. Did we mention that it’s also IP67 water and dust resistant? Never worry about sweating it out. (Not suitable for complete submersion). This makes it the perfect workout companion. Map out your jog with Glonass and GPS sensor. TicWatch S also provides independent navigation while running and cycling. Accurately track your performance with stats like steps, speed, distance, calories burned and much more. You can also accurately track your heart rate in real-time with the built-in PPG sensor. Get training mentor with six heart-rate intervals data. Stay motivated with music from your wrist. Unplug and run. With Google Play Music on TicWatch S, enjoy music without your phone. Perfect for those on a run. Be notified of incoming calls, messages, emails and news with just a glance. 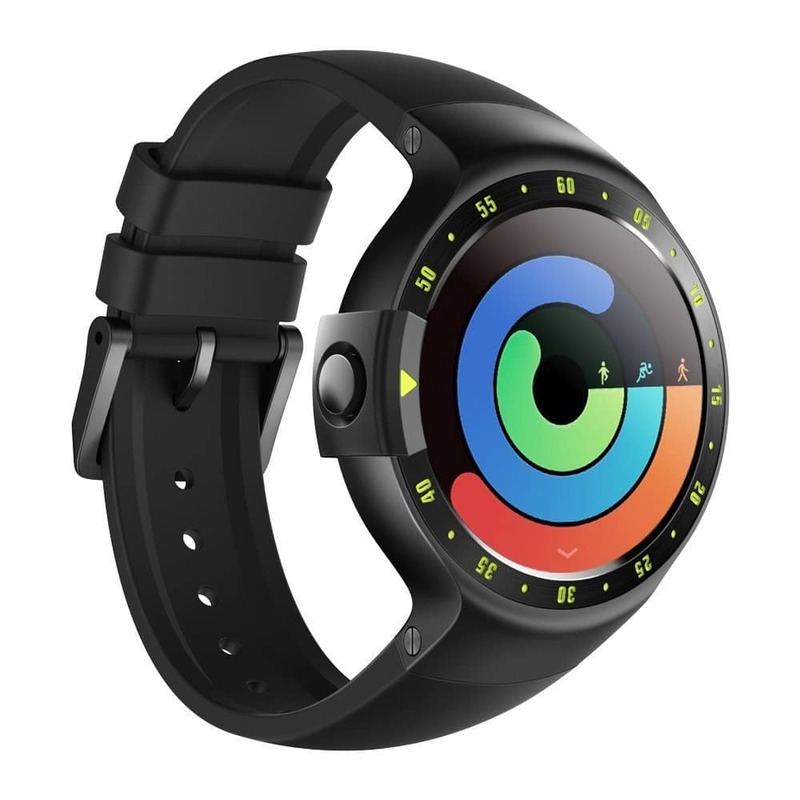 For Android users, the TicWatch S enables you to receive calls, make calls and reply to messages right from your wrist. Last but certainly not least, you can also personalize your display options with a variety of customized watch faces available on the Google Play Store. Stay connected with a glance.Personalize your watch face to show your next appointment, your fitness stats, or your contacts. Android cell phone could check calls and respond to messages, right from your watch. We hope you enjoyed reading our article on the best watches for men. As you can see, there are so many great watches out there that not only serve the purpose of fashion but function as well. From waterproof watches you can take on your adventures to smartwatches that carry the same abilities as your cell phone, the options are endless. Finding the best watches will help make your travels so much easier. Did you have a favorite watch from our selection? Let us know in the comment section below. Do you have any questions or comments for us? If so, we would love to hear them. Feel free to leave us a message below. We will be sure to get back with you soon.